Four walls, two stories tall, and sky for a roof as the seasons roll on. Beautiful, important, historic… This photo was taken in 1984. The last time I saw it, 1996, crews were moving building materials up by hand through a window into the roofed second floor. This is downtown Centro Álamos, the street name says it all, Calle Comercio. Could this building still be unused? I would hope not. 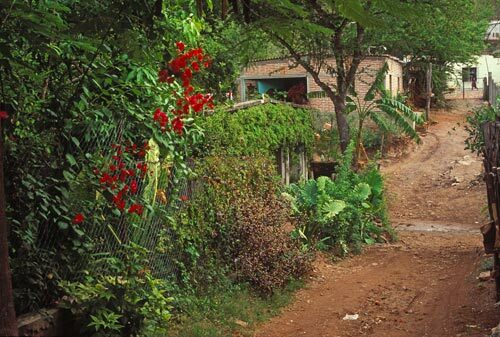 During my visits to Álamos folks would speak of running on Álamos time. The reality is everywhere runs on human-nature-time influenced by available materials, skills, events and weather of yesterday, today and tomorrow. Of collapsed roofs and open patios. Photo – Gary Ruble. 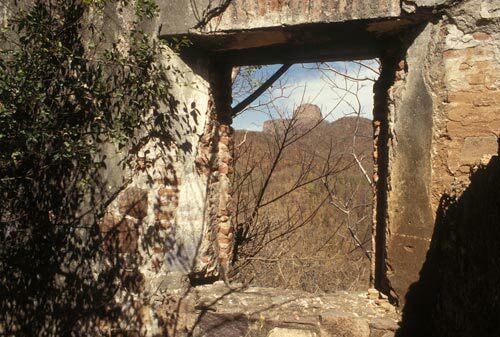 Thick joined walls were ordered in 1748 – 49 by Inspector General of the Interior, Don Jose Rodrigues Gallardo to stop squatters from taking up residence between homes. He also ordered that a proper jail be build along with a grid of streets that make up present day Centro Álamos, Sonora, Mexico. Some 270 years of events have and are playing out their hands in the poker game that history is. Cerra Cacharamba, a 3,700 above sea level volcanic plug, towers over Aduana and the rich silver beds that made Álamos what it was back then and lingers on today. Stately Cacharamba, framed like this through many west facing Álamos windows, is a clear reminder that here are powerful deep rooted forces at work. In 1908, the famed German naturalist and explorer Alexander von Humboldt visited Aduana mines, and like Vasquez de Coronado 258 years earlier, noted that this land was an exceptional place. We do not really know what spoke to Vasquez in 1540, we do know Humboldt was struck by an abundance of silver under Cerra Cacharamba. Soon the sky will be filled with stars dancing to night music. Old Promontorios, Quintera, Santo Domingo. and Zambona were established productive mines in 1908. Clarboya, San Jose, San Clemente, Plats-Pina, El Ultimo, Parra, Olvidos, Pulpito and Nueva Promontorio were developing mines in 1810. These names, some unforgettable – some forgettable, speak of miners, burros, owners, agents, suppliers, teamsters, women and children. Today mining is a dangerous occupation. Think of Aduana back then with quicksilver, accidents, greed and disease spilling across the land. Night is coming. Some will go outside, and as entertainment, stare at the changing sky until they observe their first satellite passing overhead. Fast paced music video that is more than its parts, much like Álamos itself. This is an experimental clip that weds close-ups textures shot out a moving car’s window and 120 blended stills images of Álamos life. High speed video at its best. 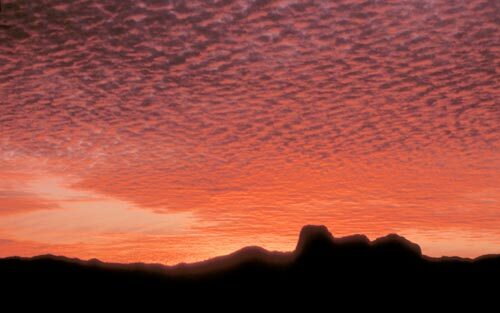 Álamos, Sonora, Mexico has never looked like this. Can you find the little house that can be hard to see? This little house caught my eye as it lived and breathed. 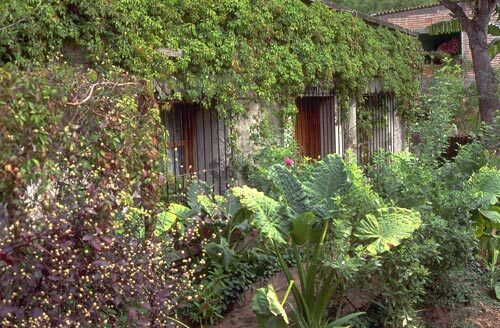 This was a wonderful casa in Barrio El Barranco. Going green has been a concept as far back as the planet’s beginning. Most poor people of the earth are off the grid. 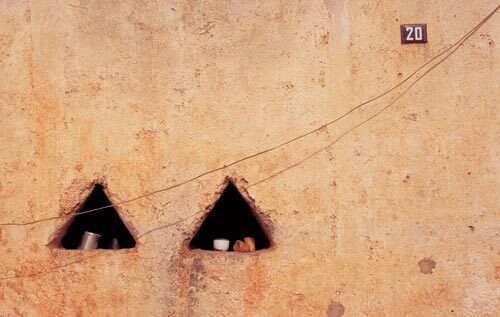 And the use of plant materials for shelter is common across the continents. This house has it all, a tribute to its surroundings. A wonderful example of a ruin restored to modern splendor. 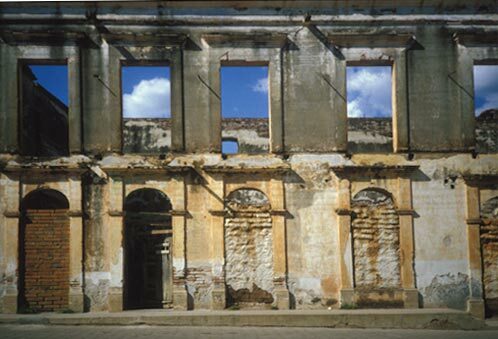 I first met this ruin on Calle Las Auroras while heading out to the airport 1983. It was still a ruin when I revisited in 1993. Work seemed to be underway to clean the property. I was told some Hollywood folks were in the process of bringing it back to life. Three years later it was a sparkling gem along a dusty road. Future posts will look at the resurrection of this home. 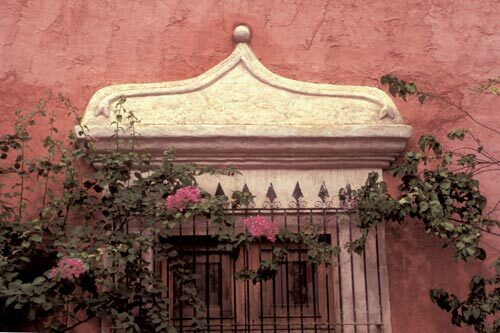 Another window treatment on Calle Las Auroras. This window seems to come from an earlier time and a different civilization. Stark triangles in a thick wall of adobe. It seemed there were children playing outside it’s door every time I passed by on my way to the airport and countryside. iron shadows dance across a white washed wall. 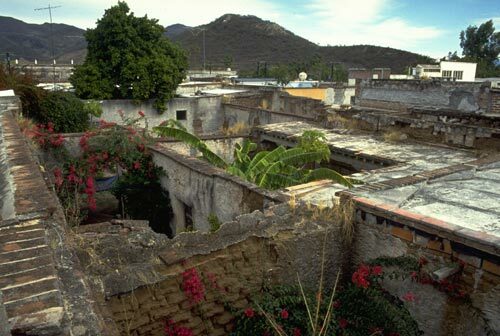 Alamos is known for its craftsmanship. 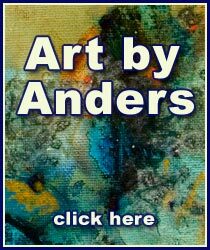 Here, there are artists amongst the trades. 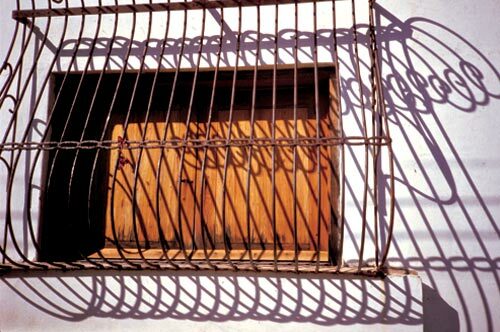 This ornamental, and functional, iron window bar, in the colonial centro, creates a show of strength and poetic movement as its shadows follow the passing sun. Elegance. 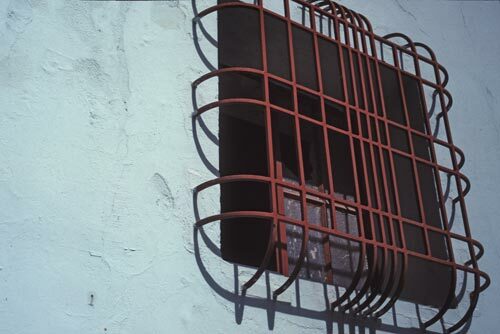 Home security begins with window bars of many colors and designs. Function. There is no doubt the intention is to protect. This bar design seem more suited for a commercial establishment along a busy street. It is all about intention.